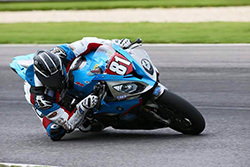 Riders of all makes and models are invited to Bob’s BMW Motorcycles to meet and hear from Jeremy Cook #81, Pro MotoAmerica BMW S1000RR Racer. Jeremy will share highlights of his racing career as well as the challenges he has encountered along the way as a privateer racer. He will provide advice and tips to help you improve your riding skills, and will provide an overview of the BMW S1000RR features and available options. On display all day: Jeremy’s custom BMW S1000RR race bike. Autograph signings before and after the presentation. Event is FREE and CrossRoads Bistro Food Truck will be on-site 10AM-2PM so arrive early to reserve your seat and stay late for a bite to eat! RSVP TODAY!